NETWORK FINALS: Game 7 of the NBA FINALS adjusted to 11.3 (although the mini-JIMMY KIMMEL LIVE didn’t benefit from the huge game rating, adjusting down to 1.1). In addition, note that the 1.1 rating for FOX’s US OPEN coverage includes the entire telecast from 11AM, not just the primetime portion. Beyond that, all the networks were in reruns, and among those, ELEMENTARY lost 0.1, and FAMILY GUY was down 0.3. CABLE HIGHLIGHTS: The number would doubtless have been even more gaudy without the basketball competition, but even so, HBO’s GAME OF THRONES towered over Sunday cable, down 0.03 from last week to 3.85. SILICON VALLEY was steady at 0.88, VEEP actually gained 0.04 to 0.43, and LAST WEEK TONIGHT fared even better, up 0.09 to 0.62. What turned out to be the two-episode series finale of Showtime’s PENNY DREADFUL only managed 0.13/0.14, compared to 0.18 last week. Another two-episode finale, Starz’s THE GIRLFRIEND EXPERIENCE, was at 0.05/180K and 0.06/209K, compared to 0.06 for last week’s single episode. There were two-episode premieres, too. TNT’s THE LAST SHIP returned at 0.41/1.785M and 0.39/1.780M–the 9PM episode isn’t on the chart because TNT had already run it after one of their NBA Playoffs games, so technically it was a rerun. Also, THE JIM GAFFIGAN SHOW returned with a pair of episodes that ran on both TV Land and Nick At Nite. On TV Land they were at 0.11/0.08, performing better on Nick At Nite where they scored 0.14/0.13. 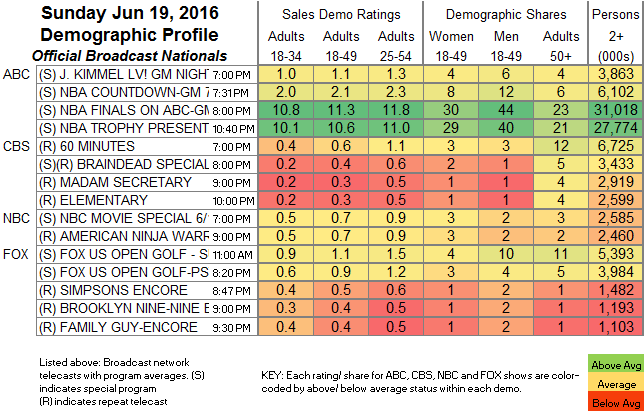 On AMC, PREACHER seemed to be the worst-hit by the NBA, down a whopping 0.25 to 0.43, while RIDE fell a tenth to 0.17. On Adult Swim, MR PICKLES was at 0.52. The season finale of Hallmark’s GOOD WITCH rose 0.03 to 0.29. USA’s MOTIVE dropped 0.11 to 0.16. 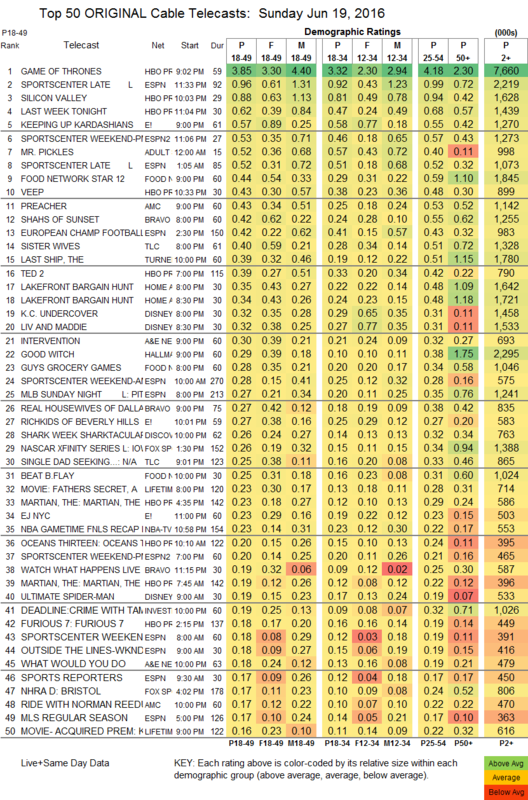 CMT’s STILL THE KING aired two episodes that were both at 0.12, compared to 0.25/0.21 for last week’s premiere. Unscripted was led by E!’s KEEPING UP WITH THE KARDASHIANS, down 0.14 to 0.57, with the lead-out finale of RICH KIDS OF BEVERLY HILLS down 0.08 to 0.27. On Food Network, FOOD NETWORK STAR lost 0.05 to 0.44, and GUY’S GROCERY GAMES was also down 0.05 to 0.28, with BEAT BOBBY FLAY at 0.25. Bravo’s SHAHS OF SUNSET dropped 0.05 to 0.42, and REAL HOUSEWIVES OF DALLAS was at 0.27. On TLC, SISTER WIVES gained 0.06 to 0.40, and SINGLE DAD SEEKING ended its season with a two-hour episode at 0.25, compared to 0.20 last week. A&E’s INTERVENTION was at 0.30.